Artist Sebastian Errazuriz says he wants "Christian Popsicles" to spark dialogue about fanaticism and violence. (CNN)–Sebastian Errazuriz has used art to take on an array of issues: New York's death rate, the Occupy movement, military suicide, children with disabilities, the brutal reign of Chilean dictator Augusto Pinochet. Now, the Brooklyn-based artist is taking aim at what he sees as religious extremism. At a party this weekend celebrating New York Design Week, which begins today, the Chilean-born artist plans to hand out 100 "Christian Popsicles" made of "frozen holy wine transformed into the blood of Christ" and featuring a crucifix instead of the tongue depressor that typically hosts the frozen treats, he said. An image of Jesus Christ positioned traditionally on the cross is visible once the ice pop is consumed. As for the frozen wine, Errazuriz said, he concealed it in a cooler and took it into a church, where it was "inadvertently blessed by the priest while turning wine into the blood of Christ during the Eucharist." Errazuriz will hand out the wine creations on Saturday at Gallery R'Pure in Manhattan's Flatiron District before the "Love It or Leave it" exhibit. According to Gallery R'Pure, 10 artists are taking part in the exhibit, which asks attendees "to revisit the objects and symbols that have forged the American landscape through the eyes of their creators." "Each piece is a personal interpretation of some aspect of American life, be it celebratory, critical or simply observational. The exhibition intends to question what the American life is, whether real or perceived," according to a news release from the gallery. Other installments include a briefcase used to address obesity in America, a white picket fence intended as a statement on the American Dream and a "MTA chair" representing the loss of New York's old wooden subway benches. 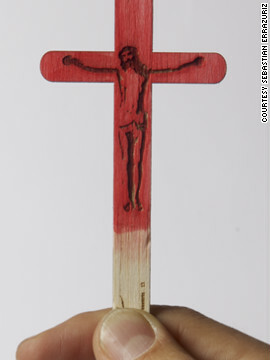 While many of the pieces are provocative, none is quite so controversial as Jesus on a Popsicle stick. No stranger to controversy, Errazuriz said his intention isn't to upset people. "It's not that I purposely want to get in trouble. I just believe if you are not doing work that can make people stop, think and discuss, then it's better not to make any work at all," he said. 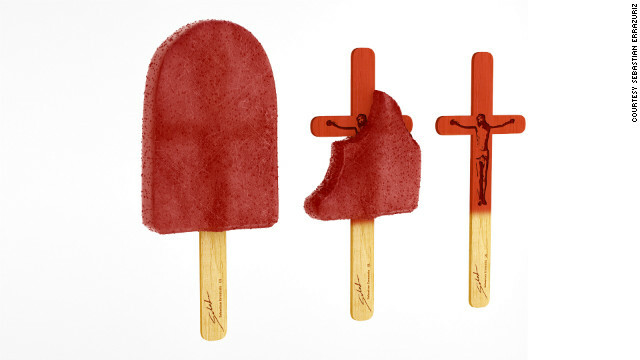 Once consumed, the Popsicle features Jesus positioned traditionally on the cross. Raised in a Catholic household, Errazuriz is now a "practicing atheist," but he has many friends and family members who are religious, and he respects their beliefs. He has always been vexed by religion, however, particularly the practitioners who wish to force their beliefs on others. "(I'm) more than happy to recommend that thinking for ourselves and questioning the realities we received from previous generations can be incredibly liberating," he said. Today, he feels that America is growing more extreme in its dogma, which is "holding a growing influence over American politics." He is especially unnerved by demands that U.S. leaders "publicly profess their faith in their god and enforce laws that defend the ideology of the Bible over individual liberties," he said. His frozen cocktails stand as a symbol, he said, an invitation to "drink the Kool-Aid" that he feels so many religious zealots are stirring up. He hopes the Popsicles will remind the gallery's visitors to take their religions - whatever they may be - a little less seriously. The United States is "rightly worried" about the threat of Islamic fanaticism, but Errazuriz wants to remind people that extremism is never acceptable, regardless of religion. "In the land of the free, it's everyone's responsibility to make sure no one will ever force their beliefs on to others," Errazuriz said. He pointed to the Ku Klux Klan, which decades ago was "a functioning, dominant political force in American society which identified (itself) as a Christian organization, carrying out ‘God’s work,’ branding the flaming cross as (its) symbol," he said. Errazuriz wants his "Christian Popsicles," which will be stained red by the wine after their consumption, to signify the relationship between fanaticism and historic religious violence. He also has hopes that the sticks "will prove Christians can take a little humor and irony - always a healthy indicator that might be harder to find amongst religious fanatics of other religions." Being extremely obese means you are especially likely to have health problems related to your weight. The good news is that even modest weight loss can improve or prevent the health problems associated with obesity. You can usually lose weight through dietary changes, increased physical activity and behavior changes. In some cases, prescription medications or weight-loss surgery may be options. ;;^.. Asking questions are really fastidious thing if you are not understanding anything entirely, however this piece of writing provides good understanding yet. Errazuriz's creation can have a more powerful message of truth fitting into the theme of the exhibit than what he wants it to be. It is great that lawmakers are holding their faith out to give guidance to the laws they pass, as that is what the founding father's did. Our inalienable rights, endowed by our Creator, life, liberty, and the PURSUIT of happiness. The freedom we experience in America is only because our founders found freedom in Christ. The stain on the popsicle stick is the blood that forgives and frees us from sin as it was shed on the cross by our Savior, Jesus Christ. This popsicle creation sheds more about the truth of our nation's heritage than the artist wants to admit. OOOO!! Do they come in Dismas and Gestas flavors too?